President Donald Trump’s strategy of becoming aggressively involved in the midterm elections is prompting concern among some Republicans who worry he’s complicating the political calculus for GOP candidates trying to outrun his popularity. But Trump has no plans to step out of the spotlight. He held a rally Saturday night in Ohio and plans to host two fundraisers at the Trump National Golf Course in Bedminster, New Jersey, next week, benefitting Senate and House candidates, according to a campaign official with knowledge of the president’s events. The official spoke on the condition of anonymity to discuss details about the fundraisers that haven’t yet been publicly released. President Donald Trump is greeted by 12th Congressional District Republican candidate Troy Balderson as he arrives on Air Force One at John Glenn Columbus International Airport in Columbus, Ohio, Aug. 4, 2018. The president is casting himself as the star of the midterms, eagerly inserting himself into hotly contested primaries, headlining rallies in pivotal swing states and increasing his fundraising efforts for Republicans. Last week, Trump agreed to donate a portion of his re-election fund to 100 GOP candidates running in competitive House and Senate races. He’s expected to be even more aggressive in the fall. White House officials say he’s reserving time on his schedule for a midterm travel and fundraising schedule likely to surpass that of former Presidents George W. Bush and Barack Obama. 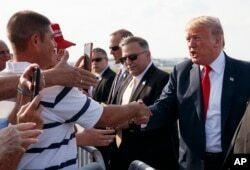 President Donald Trump greets supporters as he arrives on Air Force One at John Glenn Columbus International Airport in Columbus, Ohio, Aug. 4, 2018, en route to a rally at Olentangy Orange High School in Lewis Center, Ohio. While Republicans have won a series of special elections since Trump took office, they’ve captured smaller margins than in previous years. The GOP is worried about a special congressional election Tuesday in a central Ohio district that Trump won by 11 percentage points in 2016. A Monmouth University poll released this week showed the race tightening, leaving Republican Troy Balderson with a 1-point edge. The survey found 46 percent of likely voters approved of Trump, while 49 percent disapproved. Hoping to shore up GOP support, Trump is hosting a rally in the district Saturday night. His visit follows a Monday stop by Vice President Mike Pence. In Pennsylvania on Thursday, Trump said he was “little bit torn” about whether it would be better to shut down the government before or after the midterm elections to secure funding for his border wall. “Whether it’s before or after, we are getting it or we are closing down government,” he told thousands of supporters at a rally in Wilkes-Barre, Pa. The president’s decision to intervene in recent GOP primaries is also raising concerns among some state party officials and politicians, who fear he’s siding with candidates who could prove weaker in general elections. Trump has relished doling out endorsements, sometimes blasting out several a day, even for those who don’t need his backing right now. 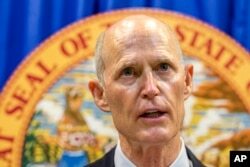 Florida Governor Rick Scott in Tallahassee, Fla., Feb. 23, 2018, is one of the candidates President Trump is putting his support behind. Trump stood onstage with Rep. Ron DeSantis, a 39-year-old three-term congressman, imploring his supporters to back his campaign for governor. DeSantis was little-known to Republican voters until Trump first tweeted support for him in December. Since then, he’s made his ties to Trump a centerpiece of his primary race, focused on Fox News appearances and ads. In recent weeks, he’s opened up a double-digit lead against state Agriculture Commissioner Adam Putnam, a longtime fixture in Florida politics.